Drifblim is typically not fast or strong enough to be offensive, and its base defenses are pathetic. Even though that hasn’t changed with the latest games, the the haunted balloon Pokémon’s usage has actually been surging significantly in 2017. Here’s why. Pokémon Sun and Moon introduce items called seeds, and they are consumables tied to the guardians of Alola that give defensive boosts depending on the battlefield’s terrain. For example, Tapu Fini always sets up a “Misty Terrain” effect when it switches in, which halves the damage from dragon-type attacks and makes all grounded-Pokemon immune to status conditions. However, if a Pokemon holding the Misty Seed item is on the field while Misty Terrain is active, it consumes the seed and gets a one-time special defense boost. As these seeds are new, it took some time for players to figure out which Pokémon could use them best. The seed-holder needs to survive on the field, yet be useful enough to make a continued impact, since switching out would waste the item’s boost. What Drifblim has over its competitors is the ability “Unburden,” which doubles the user’s speed after its held item is consumed. That juiced-up speed ensures Drifblim can support its team before being shut down by enemies. Players have used that boost to pull off all kinds of tricks. Drifblim made its first major appearance during the Anaheim regionals on Raghav Malaviya’s top-four team. He used a Misty Seed and Tapu Fini to trigger the speed and special defense boosts, giving his particular Drifblim the option to abuse the “Swagger” move. Swagger is one of the most hated in VGC for its ability to inflict confusion, which gives the target a 33% chance to hit itself instead of taking its turn as normal. Swagger also has a secondary effect: it doubles the targets attack. So, when combined with Misty Terrain (which prevents confusion), Malaviya could just jack-up his Garchomp or Arcanine’s damage output. Unfortunately for him, the strategy didn’t work as well as he’d hoped, and he was knocked out in the semifinals. 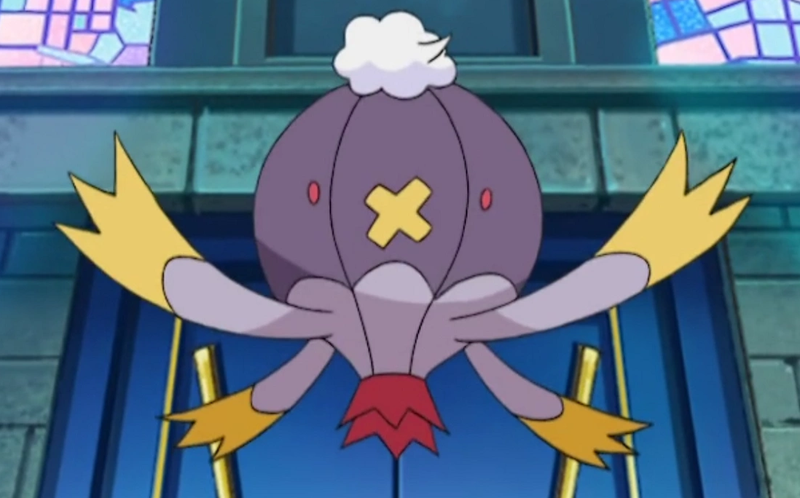 Shoma Honami was the first to use Drifblim more successfully, winning the One Nation of Gamers Pokémon Invitational largely thanks to the support of the haunted balloon Pokémon. Honami packed plenty of tricks that set the standard for Drifblim, but he primarily used it to double his team’s speed with Tailwind. This allowed his Choice Specs Tapu Lele to move first and knock out almost anything in a single hit with powerful Psychics. Since then, many players have started considering Drifblim more seriously as a key supporter. That attitude was reflected by the top 16 of last weekend’s Collinsville Regional Championship, where three players brought Drifblim and Tapu Lele. Justin Burns used the balloon beast, earning himself a spot in the finals. In his top-eight match against Thomas McCready, Drifblim put in the most work by spreading burns with Will-o-wisp. By cutting the attack stat of Pokémon such as Garchomp and Celesteela in half, Burns minimized the threats to the rest of his team and took a game one win. And while its contributions weren’t as great in game two, Drifblim did help close out game three with Shadow Ball. Thanks to Drifblim’s success at those three tournaments, its usage is expanding from niche to mainstream. For the most part, players seem to be taking the shift with a mix of excitement and respect. Only four made it to the second day of competition at the Oceana International Championships in Melbourne, but Zoe Lou managed to win with the entire tournament with it. Now that Drifblim has risen to the top of some of this year’s fiercest competition, it may well have earned a one-time spot in the history books as a truly viable support Pokémon. Correction 2:32 PM: We initially cited the wrong percentage chance for the status effect Confusion.